This page involves something that has not been specifically named. The name(s) presented in this article could be conjectural. 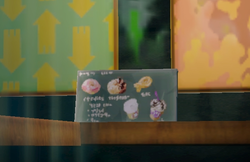 Inkopolis Café is located underneath the Inkopolis News Studio in Inkopolis Plaza. It is on the left of the entrance to Spyke's alley. It cannot be entered without the use of the out-of-bounds glitch. The café has a big, curved glass window. Its shape matches the Inkopolis News Studio above it. Inside, there is a counter where customers can buy food and drinks, with a menu on it. There are no lights in the café, and there is no one inside it. Occasionally a Jellyfish (and sometimes two Inklings as well) can be seen dancing outside the window. Another picture of the café's inside. This page was last edited on 18 August 2018, at 21:39. This page has been accessed 6,967 times.